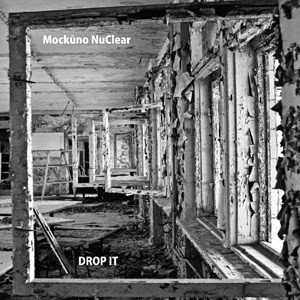 Gapplegate Music Review: Mockuno NuClear, "Drop It"
The current avant scene may not be in the focal sights of the mass media or the general public, but it thrives nonetheless. As Edgard Varese once said, and Frank Zappa espoused, "the present-day composer refuses to die." That can also be said for the improvising musicians out there in new jazz land. A not as yet well-known group from Europe, Mockuno NuClear, serves as an example. Their CD Drop It (No Business 37) gives you evidence (if you needed any) that the work of innovation and synthesis, advance and retrenchment continues on in ways that show vitality. Now you may have to search it out. The era where there was for example Sam Goody stores in multiple neighborhoods routinely stocking the newest avant music may be a thing of the past (though tomorrow in the States it is Record Store Day), and important small boutique labels like No Business (centered in Lithuania) may not find themselves on display in a chain like Best Buy, but the music is still being made and much of it is very good and innovative to boot. So today we take a look at Drop It. Mockuno NuClear is a trio of Liudas Mockunas on soprano, tenor and bass saxes; Dmitrij Golovanov on piano and keys; and Marijus Aleksa on drums; augmented by the bass of Vytis Nivinskas on two cuts and the second drumming of Darius Rudis on one. This is a band that has the freedom of the "new thing" tradition with some of the power and electricity of post-Milesian psychedelia and the kind of zany avant compositional style and improvisational insouciance of ICP and the Ganelin Trio. Liudas has his own coloristic-noteful facility on all three saxes, Dmitrij has out improv key chops but can rock out too when needed, and Marijus feels equally comfortable in out-swing, out-rock, or out-out settings. With all this as a backdrop, the band covers its territory with energy and creativity. You may not know what is coming next as you first listen, but that is a good thing, isn't it? And once you piece together the whole set in your head after a few listens, if you are like me, you'll find that this is an impressive effort. Perhaps the biggest surprise is "Elephant Tango," where, after various moods and transgressions against what is supposed to go with what have taken place, they burst into a burlesque Bechet-does-a-tango thing that will make you smile with appreciation. That's how this album goes. It's rather irresistible once you surrender to its ways. Encore! The Ames Room, "Bird Dies"